He succeeds Christy Clark as the party's leader. 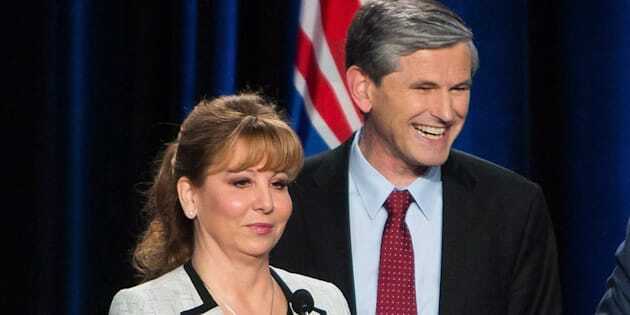 Dianne Watts and Andrew Wilkinson take a break during a leadership debate in Vancouver on Jan. 23, 2018. VANCOUVER — British Columbia's Liberals turned to a former cabinet minister with a blue blood intellectual pedigree and deep rural roots to lead them Saturday night, as Andrew Wilkinson appealed to his caucus colleagues to help him expand and broaden the party's membership. Wilkinson, 60, a doctor, lawyer and Rhodes Scholar, said leadership candidates who pushed the party to widen its support should be listened to after losing its 16-year grip on power last year. "Take those Liberal values, build out this party,'' he said after defeating former Conservative MP Dianne Watts in a fifth round of vote counting. Andrew Wilkinson, centre, makes his way to the stage through the crowd after being elected leader of the British Columbia Liberal Party in Vancouver on Feb. 3, 2018. A supporter of candidate Dianne Watts covers her ears as Chinese lion dancers perform as B.C. Liberal Party members and supporters await the results of a leadership vote in Vancouver Feb. 3, 2018. He stood on the stage after his victory with his wife Barbara Grantham, members of the Liberal caucus and Watts, who resigned as a federal Conservative MP to seek the party leadership in a field of six candidates. Wilkinson said the Liberals must unite as a party and get back to the days and values of former Liberal premiers Christy Clark and Gordon Campbell. He also began to galvanize the party to fight a referendum this fall on proportional representation, saying it would benefit the NDP and Greens who support changing the province's voting system. Prior to his political career, Wilkinson worked as a lawyer in Vancouver and before that he was a doctor in different parts of B.C., including Campbell River, Lillooet and Dease Lake. He served in a number of cabinet positions, among them attorney general, minister of advanced education, and minister of technology and innovation. The hotel ballroom erupted with cheers of "Andrew, Andrew'' when he defeated Watts. He won with just over 53 per cent support after the final round of vote counting, while Watts had just under 47 per cent. Watts led the contest after four rounds of voting. Watts indicated she wants to play a role in B.C. politics in the future. Andrew Wilkinson celebrates after being elected leader of the British Columbia Liberal Party in Vancouver on Feb. 3, 2018. Chinese lion dancers perform as B.C. Liberal Party members and supporters await the results of a leadership vote in Vancouver on Feb. 3, 2018. Barinder Rasode, a two-term Surrey councillor and former mayoral candidate, said Wilkinson will bring the Liberals back from their low point following last year's election. New Democrat Ravi Kahlon congratulated Wilkinson on behalf of the governing party. "Right now, the stakes couldn't be higher for British Columbians. People are counting on us to make life more affordable, protect the services they count on and keep investing in a sustainable economy,'' Kahlon said in a statement. Green party Leader Andrew Weaver also congratulated Wilkinson. The two men have engaged in testy debates in the legislature. Former transportation minister Todd Stone, one-time finance minister Mike de Jong and Liberal caucus members Sam Sullivan and Michael Lee were eliminated from the leadership contest earlier in the evening. An estimated 60,000 party members were eligible to vote online and by phone to replace Clark, who resigned after the New Democrats formed a minority government last summer with support from the Greens. The Liberals used a preferential ballot that allowed its members to rank the candidates, and points were awarded based on their support. The B.C. Liberal party is not affiliated with the federal Liberals. It describes itself as "a made-in-B.C. free enterprise coalition'' that includes members of the federal Conservative and Liberal parties. Todd Stone, Michael Lee, Andrew Wilkinson, Dianne Watts, Sam Sullivan, Michael de Jong are pictured during the B.C Liberal Leadership debate in Vancouver Jan. 23, 2018. Getting the party back to power after a lacklustre election campaign last May was the main focus of the leadership campaign. There was finger-pointing in debates over who was to blame for the Liberal downfall, despite B.C. boasting the strongest economy in Canada. Wilkinson ran his campaign on four priorities: security, opportunity, prosperity and sustainability. His promises included selling government-owned liquor stores, establishing a junior kindergarten pilot program, improving skills training for Indigenous youth, providing tax incentives to increase the supply of rental housing and taking regulatory steps that would allow municipalities to increase the supply of new housing. Watts, who is a former mayor of Surrey, was the only candidate who was not part of the Liberal caucus in the legislature. She resigned her House of Commons seat to seek the party's leadership. Wilkinson, Stone and de Jong were longtime members of Clark's cabinet. Sullivan, a former Vancouver mayor, was appointed to Clark's cabinet in her government's final weeks in power.